All Saints Cathedral also includes our Dinka community. The Dinka are a language group of Christians from the southern Sudan. Over the last decade many people from this part of the world have been driven out of their homeland and many became refugees. All Saints’ sponsored some of these refugees and other individuals and families who came to Edmonton have joined this group within our All Saints’ community. On 8 Jun 2014, The Day of Pentecost, the Sudanese community became their own parish within All Saints’ Cathedral: the parish was named St. Mark’s-Jieng. 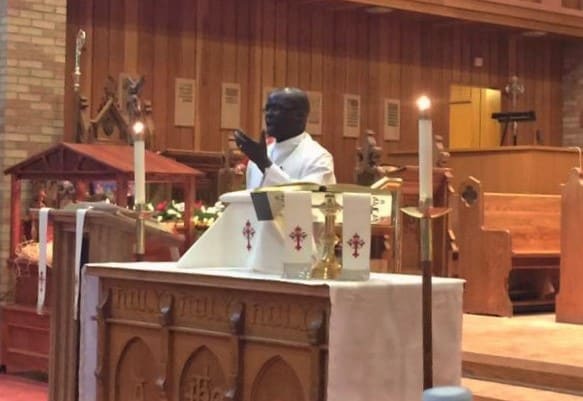 The parish is led by the Reverend Akon Lual Akon, Rector, and by the Reverend John Ayuen, Assistant Priest. Mission/Aim/Vision: To proclaim the Good News, help faith grow, and reach out to the community through God’s Love and through their church services. Worship: Our worship time is Sundays, 2:00pm at All Saints’ Cathedral, and is based on the Dinka Book of Common Prayer. Our worship is always conducted in the Dinka Language, in Anglican traditions, with lovely music. It sometimes switches to an English service during big Occasions.